Often times, the problem isn’t the indifference of others but the mountains of misinformation already out there. For example, if you ask people, “who was the first goalie to wear a mask?” most of those who’ll offer an answer will say, “Jacques Plante.” Plante was my first favorite hockey player when I was a boy and he was starring with the Maple Leafs. He had certainly popularized the use of goalie masks, but he wasn’t the first to wear one … even in an NHL game. Before he wore one in game action for the first time on November 1, 1959, Plante had been one of many goalies (most of the others at the amateur level) experimenting with masks in the late 1950s. In September of 1957, Delbert Louch of St. Mary’s, Ontario, unveiled a “head-protector and face-shield” that caught on with many NHL goalies for practice, but proved impractical for games. Long before then, a handful of goalies wore wire masks (like baseball catcher’s masks) in international competition in the 1930s, and many people know that Clint Benedict wore a mask with the Montreal Maroons in February and March of 1930 during his final season in the NHL. Benedict’s was a leather face shield he wore after being sidelined for several weeks following a couple of shots to the face that January. The NHL had modernized its forward passing rules for the 1929–30 season, and just as the schedule was getting under way, Conn Smythe of the Toronto Maple Leafs stated that he planned to introduce a proposal at the next league meeting making it mandatory for all NHL goalies to wear masks. Smythe stated that there were several NHL managers in favor of the move, but no goalie wanted to be the first, so a rule should be adopted to compel them all to do so. 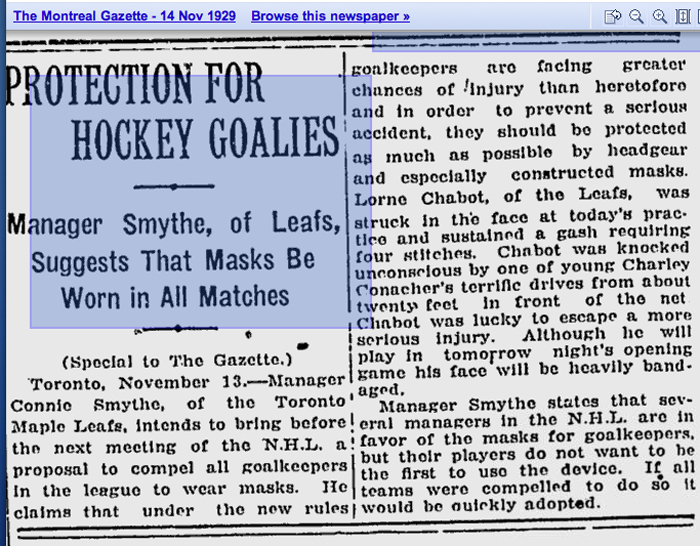 Apparently, the Ontario Hockey Association had passed such a rule for the 1920–21 season saying that goalies may wear a mask for protection though nobody appears to have done so. Despite what Smythe said in 1929, it would be many years before the NHL adopted similar legislation. Amazingly, even as late as 2009–10, the NHL rule book only said that: Protective masks of a design approved by the League may be worn by goalkeepers. The wording was not changed to say must be worn until 2010-11! Whatever it was Giroux was wearing, he does not appear to have used it when the Marlboros played their first exhibition game in Barrie on December 18, nor in any games that followed during the 1903-04 season. He was said to be having trouble locating shots from the side while wearing it. Baseball catcher’s masks date back to the 1880s, and hockey goalies were quick to adopt cricket pads for added protection during the 1890s, but for now, Giroux’s brief experiment is the oldest usage of a mask by a goalie that I’m aware of. 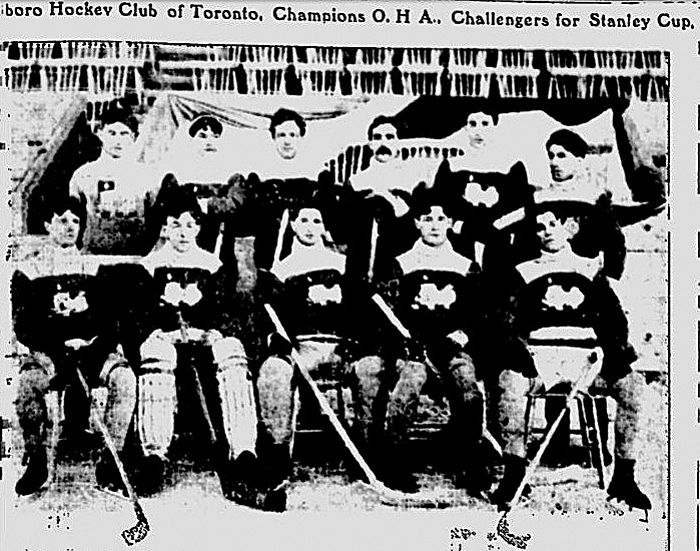 Giroux wears the pads (but no mask) while seated second from the left with the Marlboros in 1904. Tommy Phillips is seated second from the right. Giroux followed Phillips to the Kenora Thistles in 1905. They won the Stanley Cup in 1907. Another great read Eric! Lots of fresh little tidbits…Please keep them coming!! That’s a great story, Eric. Good research. By the way, I’m surprised that Plante was your favourite player in the early seventies. I’ve never heard anyone say that before. It’s refreshing! That’s probably a lot more information than you needed! I really enjoyed this article, so generously stuffed with things I didn’t know! Thanks so much for this terrific article. Plante was one my favourites too! I used to draw/paint pictures of him all the time and even made a bronze of him in a Bruins uniform. Got to meet him once during his WHA days at Varsity Arena. As a kid growing up in and playing hockey in Montreal I the 50’s I thought Jacques Plante was the quintessential goalie. As I understand it he revolutionized goaltending through his habit of playing the puck up to his defensemen as well as by using the face mask. I’m not sure Jacques ate peas so more research needs to be done. When he left the Habs through some dispute with the coach Toe Blake, it was as if he dropped off the face of the earth for us Montrealers. As an aside, I remember hoisting many a pint in the 60’s at the Toe Blake Tavern and the Henri Richard Tavern on Park Avenue, both near McGill University where I was an undergraduate. You are NOT a nerd Eric!! I love your passion & enthusiasm for hockey!! That makes you a very knowledgeable person…. Funny I was just chatting with a friend of mine in UK about ‘labels’ & how narrowingly defining they can be & so wrong! Wonderful research and story — thanks!